Get your own directory of creative department executives when you buy this affordable creative director mailing list from Bookyourdata.com. 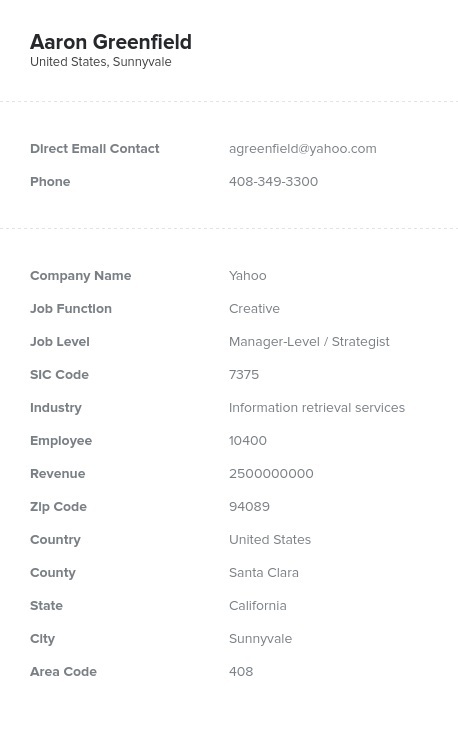 Reach creative department vice presidents in your target territory fast: Just use this verified chief of creative email list from Bookyourdata.com. Creative department senior managers are always looking for the latest tools to help them do their jobs. They're focused on finding ways to get their message out and catch the attention of consumers, and with Bookyourdata.com, you can do the same, putting your products or services in front of leaders of creative departments at numerous firms. Our creative department VP mailing list can help you reach the people in charge of companies' creative efforts, people with job titles such as "vice president of creative" and "senior creative department manager." Our premium creative department chief email database is both machine-checked and human-verified for accuracy, and it comes loaded with information. You can buy this pre-built creative director email list and get started with your marketing campaign right away, or you can use our custom list tool to make a targeted creative industry executive mailing list of your own that gets right to the people you want to talk to, narrowing your business contact list using factors like company size or location. Use our accurate B2B email lists to cultivate strong business relationships with creative directors and you'll have key contact information at your fingertips, whether you want to email leads, cold-call them, or send direct mail. We even provide their fax numbers. When you buy a comprehensive creative industry email database from Bookyourdata.com, you get all of the necessary information to follow up on solid sales leads and generate revenue.